The common emerald dove (Chalcophaps indica) belongs to the family of pigeons and doves, Columbidae. The common emerald dove species are distributed in Indian subcontinent, southeast Asia, China and Taiwan. This emerald dove species is the state bird of the Indian state of Tamil Nadu. These emerald doves are polytypic species. The common emerald dove (Chalcophaps indica) is a medium-sized pigeon, measuring 25 to 30 cm in length and weighing 90 to 170 grams. The common emerald dove species have bright glossy green back and wings. These birds are sexually dimorphic. The male has a pale bluish gray crown and nape. There is a white stripe on the forehead, which extends over and behind the eyes. There is a white patch on the edge of the shoulders. The female lacks these features. The common emerald dove species have dark vinous pink chin, throat, upper breast and the sides of the neck. The flight feathers and tail are dark gray. There are broad white and black bars on the lower back. The lower belly is grayish brown. The bill is bright red. The irises are dark brown. The eye-ring is gray. The feet are grayish red. Their call is a repeated, low-pitched, mournful cooing sound. These common emerald dove species are distributed in India, Sri Lanka, Nepal, Bhutan, Bangladesh, China, Taiwan, Myanmar, Thailand, Cambodia, Laos, Vietnam, Malaysia, Singapore, Indonesia, Brunei, Philippines and Christmas Island. In India, these common emerald dove species are distributed in the states of Tamil Nadu, Kerala, Karnataka, Goa, Andhra Pradesh, Telangana, Maharashtra, Odisha, Chhattisgarh, Jharkhand, West Bengal, Assam, Meghalaya, Arunachal Pradesh, Nagaland, Manipur, Tripura, Mizoram and Andaman and Nicobar Islands. The common emerald dove nominate subspecies C. i. indica is distributed in the Indian subcontinent, China, Taiwan and southeast Asia. The subspecies C. i. robinsoni is distributed in Sri Lanka. 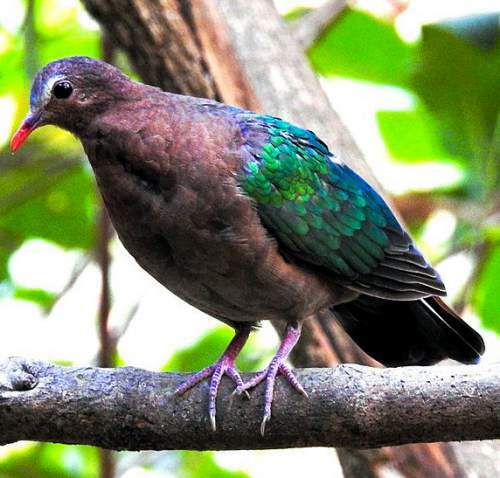 The common emerald dove subspecies C. i. maxima is distributed in Andaman Islands (India). The subspecies C. i. augusta is distributed in Nicobar Islands. The subspecies C. i. natalis is distributed in Christmas Island (Australia). The subspecies C. i. minima is distributed in northwest New Guinea. These common emerald dove species have moderate forest dependence. They normally occur in altitudes from 0 to 1450 meters. The artificial ecosystems and habitats of these species include cultivated lands and plantations. 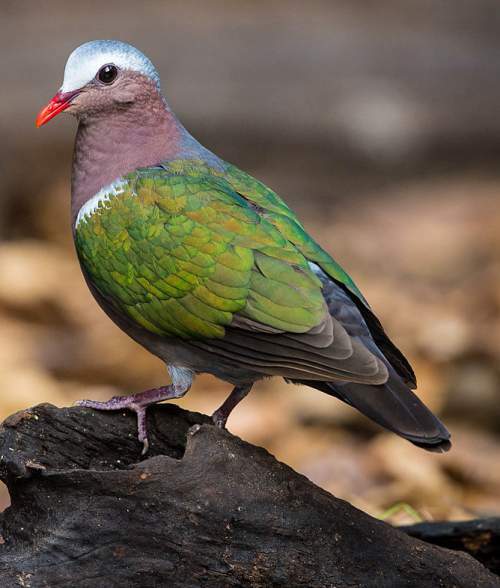 The natural ecosystems and habitats of these common emerald dove species include tropical and subtropical moist lowland forests, mangrove forests, moist montane forests, rainforests and evergreen forests. The diet of common emerald dove consists mainly of seeds and fruits. Fallen fruits, seeds, berries, figs and insects are their primary food. Most of the time they forage on the ground. They roost on the tree branches. These common emerald dove species breed year-round in most of their breeding range. They are monogamous and territorial. Male performs courtship dance by bobbing its head. These emerald dove species nest on the fork in trees, up to five meters from ground. The nest is a flimsy structure built with sticks and twigs. The typical clutch contains two cream-colored eggs. Both of the parents, take part in nest building, egg incubation and care of young. The hatchlings are initially fed with crop-milk by the parents. These common emerald dove species are non-migratory, resident birds. The birds in higher altitudes move to lower levels and plains during winter. Post breeding, the juvenile emerald doves may disperse and establish in new locations within the range. They may make local movements for feeding and breeding within their range. The global population size of the common emerald dove (Chalcophaps indica) has not been quantified. The overall population trend of these species is considered to be decreasing. Throughout its range, this emerald dove species is reported to be uncommon to common. The generation length is 5.6 years. Its distribution size is about 21,300,000 sq.km. Habitat alteration and destruction, predation by feral cats and capture for pet-trade are the main threats that may endanger the survival of these emerald dove species. 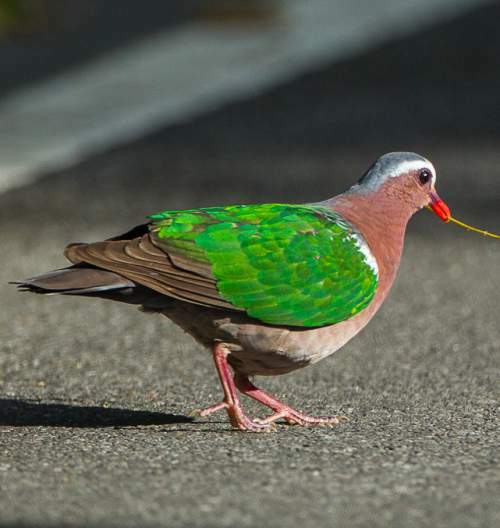 The common emerald dove (Chalcophaps indica) does not approach the thresholds for being Vulnerable either under the range size criterion, or under the population trend criterion or under the population size criterion. The IUCN (International Union for Conservation of Nature) has categorized and evaluated the emerald dove species and has listed it as of "Least Concern". The CITES (Convention on International Trade in Endangered Species of Wild Fauna and Flora) status is ‘Not Evaluated’ for common emerald dove (Chalcophaps indica). The common emerald dove (Chalcophaps indica) is closely related to Stephan's emerald dove (Chalcophaps stephani) and Pacific emerald dove (Chalcophaps longirostris). The six recognized subspecies of common emerald dove are: C. i. indica (Linnaeus, 1758), C. i. minima E. J. O. Hartert, 1931, C. i. robinsoni E. C. S. Baker, 1928, C. i. natalis Lister, 1889, C. i. maxima E. J. O. Hartert, 1931 and C. i. augusta Bonaparte, 1855. Current topic in Birds of India: Common emerald dove - Chalcophaps indica.